The other day I decided it would be a good idea to try out a random hairstyle that I've been secretly lusting after for a while now. (I hold Pinterest fully responsible, as well as the current issue of Real Simple.) Eisley rarely lets me blow-dry my hair these days, considering she immediately goes into fits of rage whenever I turn it on and clings to my legs like her world is shattering into a million pieces. There's just something about my child looking at me with tear-filled eyes that say, "MOMMY, WHY DO YOU HATE ME?" Yeah, it's lovely. That said, at a certain point there's only so much dry shampoo can do to make me look like a decent human being, and I simply have to wash my hair knowing I may not get to make it look pretty. My hair is naturally wavy, but not in the way that I can just let it dry and walk out of the house without feeling all undone and awkward. Perhaps someday I'll get a handle on it, but every time I try to let it dry naturally I just feel like a mess. This is where the braids come in. After walking around the house with the braids, trying to be casual and/or like a cool person on Pinterest or in the current issue of Real Simple, I decided that I liked it. (Jay didn't even give me the eyes of judgement when he came home, although I know he was probably wondering what the heck was going on with my head but just wanted to be polite and ignore the whole thing.) I kind of wonder if anyone can wear their hair like this and feel fully normal, anyway. It's like bright red lipstick or adult rompers. If you go out wearing it, people will...notice. Not necessarily in a bad way (unless we're talking about me in a romper, because, really now) but it's something that catches your eye. So, the verdict? You may not see me wearing these braids in public, but that won't stop me from taking photos that make me look more hip and stylish than I feel. Right? Right. In other news, I haven't been able to shake this melancholy feeling lately. It's that feeling of something missing, even when everything around me seems perfectly perfect. I'd like to blame my continued sleep deprivation or constant need to over-analyze every little thing, but something tells me it's more than that. To try to wrap my mind around it (and fill my heart a bit), I'm joining She Reads Truth—unfortunately, I'm a little late to the game, but better late than never. And to be perfectly honest, it already feels like this is the sort of thing I've been missing in my days. Oh my goodness with the tendril. I feel your pain. Also? 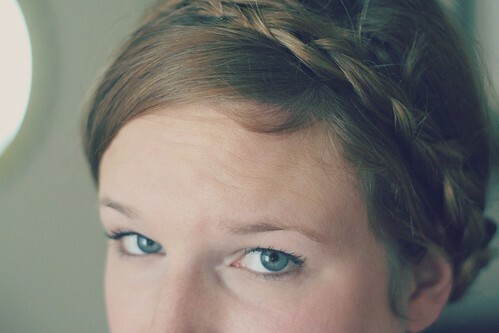 I think the milkmaid braids look adorable on you. the milkmaid braids look cute on you. and i hope you get out of that funk. those are never fun. Drew HATES the hairdryer. I was drying my hair in a hotel one day and he LOST IT. I realized how little I actually 'do myself up' because he had basically never seen it before. Hehe. I haven't gotten the guts to wear this look in public either...but I still took a photo of it! :) However, I do love this look on you! You know, I had that feeling about 6 months after I had my baby. I thought that it was just that I was still adjusting to life with a baby and that I was getting ready for my summer break to be over and I had to leave him again. I just felt like something was...missing...I tired to go out with my friends, leave the house, get my hair done, date nights with hubby, and nothing was really working. I went to the doctor and she put me on an anti-dep pill. I was only on it for 3 or 4 months while I dealt with my transition and got myself back. There was just one day when I woke up and though, I don't need this anymore, and I haven't been on it since. I was not all about medicine to make myself feel better, but I was lost. I needed me back. You seem like such a wonderful person and I hope you can find what it is that picks your spirit up and makes you feel like you again! You look so so so adorable, lovely lady. Seriously. I think it's a cute look!!! As for me, I constantly try pigtails when my hair is long and I think smexy women look SO hott with them... yet I feel like I look 10. Oi! Based upon the sneak peek pic, THAT BRAID IS ADOREABLE ON YOU. I started She Reads Truth, too, though a few days late! Still catching up! I love the braid and think you could totally rock it in public. Have you read The Happiness Project? I think it's right up your alley! I'm still only on the first month of her year-long journey to find ways to be happier and more organized, etc. Ohmygoodness you crack me up. I swear you are writing what most of us are thinking. I absolutely love that about your blog - the way you make us all say "ME TOO!!". I hope you find that missing something. I know we all go thru that at one point or another (or several points) thru life. Hang in there.